For those with typical office 9-5 jobs, you likely spend 1/3 of your life and nearly 1/2 of your waking life at the office. That is a huge amount of your time spent away from your home and also away from any preparedness supplies you stocked at home. Thinking about your office situation should be apart of your preparedness plan. Paper cuts, allergies, and headaches still occur at the office. Keep a basic first aid kit with common medications available for your personal use. I know my office has a first aid kit in the common area but I am not sure how often that is restocked. A small desk drawer can serve as your preparedness supply drawer, and a first aid kit is a great first addition. In my office, we have common equipment such as computers, printers, and our safes. This means we all touch the same surfaces routinely. If someone in the office gets a cold, chances are others will too! The cleaning wet wipes, alcohol or bleach based, can remove the flu from keyboards and common desk surfaces. I sure don't want to be that crazy lady who cleans doorknobs, but if someone is sick or I am, I will definitely wipe down a keyboard before I touch it. I keep my office well stocked with a container of cleaning wipes, which is especially important during flu season. Food and water are the basic components of life, and you spend a large part of your life at the office. I prefer not to eat in my cafeteria, always bringing my lunch from home. In addition, I keep protein bars (my favorite) and extra bottled water in my office. If there was ever an issue with the office water supply or I lose my lunch, I will have food to give me the energy to get home. You could keep oatmeal, jerky, snacks, nuts, or peanut butter and crackers. "But if I keep food in my office, I will eat it!" I hear this response many times, to which one of my coworkers provided the solution. Keep food you don't really like, but would eat in an emergency. I also keep granola bars that I am not a fan of but will eat if desperate. This way, if I will only eat them if I am truly hungry and not just bored. I could not stand for wearing high heels everyday to work and I pity the woman whose office place demands it. I believe good shoes are the foundation of which the rest of your body relies on, and you need a firm foundation. Whether running between meetings, avoiding construction debris in the hallway, or walking between buildings outside; I believe comfortable and protective shoes should be worn by all. In the extreme case of an active shooter or active threat in your office, good shoes are a must when running from danger. I wear Merrell hiking shoes to work, they come in the business casual all black but provide support. I understand they aren't for everyone, but between my standing desk, walking up stairs and across our large campus, I find good shoes are a must. Luckily for me, most of my coworkers agree and wear similarly sensible shoes, making it business appropriate. In many workplaces, guns and weapons are not allowed. Take a look at your workplace guidelines before packing your purse or pockets for the new job. Perhaps a small knife like mine in your purse would suffice to keep you feeling safe and protected. Taking a martial arts class could boost your confidence in being able to defend yourself, when you are at work and have no available weapons. While rare, workplace violence happens and it's best to know your options and be comfortable using them. Take note of items in your office that could be used as a weapon if the circumstances arose. Run if you can, Hide if you can't, Fight for your Life. In primary and secondary school, we did drills all the time for what to do in a fire. We walk calmly from the classroom to the nearest exit and line up in the parking lot. When I was a kid, it seemed like we did drills once a month. At my office, we do drills once every two years, or so it seems. If you have never done a fire drill at your work place, take a moment to think of your exit options. Talk to security about the procedures you should follow as to where to go if you are unsure. One thing I am quick to tell new employees is that in our offices and laboratories, the fire alarm is also the toxic gas alarm. So if even you don't see a fire, don't take your time evacuating the office, as you don't know the danger it is alerting for. After evacuating the building, if you plan to leave the vicinity know multiple routes home. If your common commuting route is blocked or congested, its good to know a way around the traffic without having to fumble with a GPS to navigate home. Consider keeping a lightweight Get-Home bag in your office (or car). This is a bag you can easily carry for miles, that contains just enough supplies to get you home. It is not as big as a 72-Hr bag, although they look very similar. What it contains specifically will depend on your expected commute and what conditions you expect to face. It could include: portable food, water, flashlight, a simple weapon, maybe an extra pair of socks, and a rain jacket. It could also include a small first aid kit, a dust mask (N95), cash, and a map of the local area. See Get Home Bag Basics and 4 Steps to Building a 72hr Bag for full descriptions and details. A few simple steps today can make your office a safe and prepared place to spend you time. Whether it is a power outage, paper cut, or fire alarm, you will be well prepared to face the challenge. If you can't keep supplies in your job building, hopefully you can store the Get Home Bag and your First Aid Kit in your car. Finally, rest well, knowing you are prepared for emergencies at work. Have you ever had an accident or emergency in your office? What did you have on hand to help or wish you had? Share your story in the comments below. Prepping supplies don’t last forever. Food can go bad, tools can rust, items can be taken from the stock and not replaced, or needs can change. It can be hard to keep up with all the inventory; food expiration dates, water rotation times, medication usage. In our household, each month we have one area that we check on. It usually takes less than an hour to check through the stock and add the needed items to our next shopping list. One hour a month keeps our supplies fresh. I will share today our 6-month rotation plan. I mark my google calendar with an event and on the first of the month I get a reminder of which category to check for the month. Home canned goods last for about a year, commercially canned foods can last longer but not all food items have yearlong expiration dates. A 6-month supply is cheaper than a 1-year supply. For those on a tight budget, finding extra cash for prepping can be hard. If you come to your band-aides for example and find you didn't need any in the last 6-months, you can buy your normal 6-month supply again. Now you have doubled your supply, without stressing your bank account too much. It makes a nice incrementally way to stock up. We spend a lot of time in our cars, and I am almost always with my car. I drive to work, drive home, drive to friends, drive to the store, you get the point. I see it as a priority to ensure my car is in the best functioning condition and fully stocked with what is supposed to be in there. We start the checklist in January, as for colder climates the weather is starting to get pretty snowy so it's a good time to check up on winter gear. For July, it's the turn of the seasons, and prepping for summer fun. Am I prepared for any roadside emergencies I could expect in my area? Is there a safe way to carry water? Check out ----- 35 Items You Need To Put in Your Car Right Now---- for a complete list of what I store in my car. The 72-hr bag is a backpack with everything you need for 3 days. It could be grabbed on the way out the door during evacuations or it could be kept in your car for when you can't make it back home. Information is the important details of your life that would be hard to do business without: SSN, medical insurance, car insurance, etc. We are know you need water to live. Cleaning supplies are handy when water is scarce. Stocking both allow you to save your water for drinking cooking and your life from a dirty mess. Your first aid kit is bound to get used the most, as you take items you need over the months. Replacing used band aides and allergy medications are top reasons we check our first aid kit every six months. EDC is every day carry: The items you keep in your pockets or purse that you always have with you. These items also can get used, lost or misplaced over time. Be sure to check that you have what you think you have. Medicine Cabinet: What other medications do you use on a monthly basis? What is a 6-month supply of those items? A man's gotta eat. Food storage can be as simple as canned goods or more complicated rice and beans sealed in mylar bags with oxygen absorbers. But we often steal from our canned good supplies and need to reminder to check it has what it should. Is this 1-month supply of food things we normally eat? Are there items we normally eat that are not included? I cover what’s in my compact food storage for one person for a month. While we touched on sanitation when checking our cleaning supplies paper products can also reduce the amount of water needed. Toilet paper is as much a comfort item as it is a convenience and sanitation item. 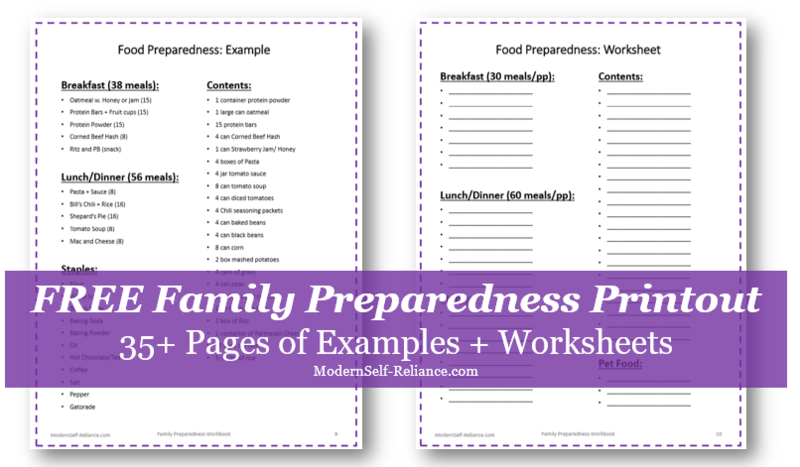 At Modern Self-Reliance, we hope to share what works for us in the hopes it helps other people become more prepared, organized and self-reliant. Did you find this helpful? What others things do you check regularly? Thanks for reading our work.